Apple season has commenced at Shields Orchard for 2019. It's the perfect excuse to pack the kids for a day trip to Shields Orchard which is an easy 1.5 hours drive or 91km from Sydney and located on the main road of Bells Line of Road. I hear that 2019 has been a good season with most apple varieties having a good crop due to the good rains during spring and summer. 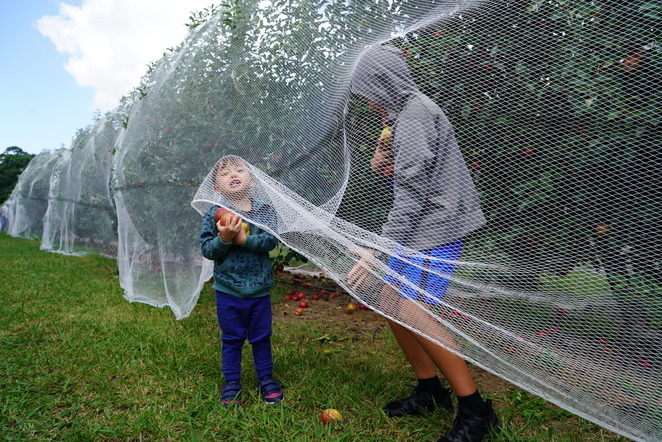 The nets are out covering the apple trees to keep the birds at bay. Shields Orchard has a light crop of Royal Gala apples that are currently ripe for the picking followed by Jonathon apples. Royal Gala apples came about from crossing a golden delicious and Kidd's orange red in New Zealand. The Gala refers to the red colouring and is known for its sweet aromatic dessert qualities perfect for eating raw, cooked or used to make sauces. Jonathon apples originated from the United States and are medium-sized, sweet but slightly tart apples with tough skin. They're great for eating fresh and cooking. The orchard sprawls over six hectares, mainly growing apples, some stone fruit, grapes, figs and potatoes. As it's the start of the season, there are plenty of apples to pick. There will also be an offer to pick your own Williams, Packham or Buerre Bosc pears too. You can spend the whole afternoon discovering this delightful orchard. 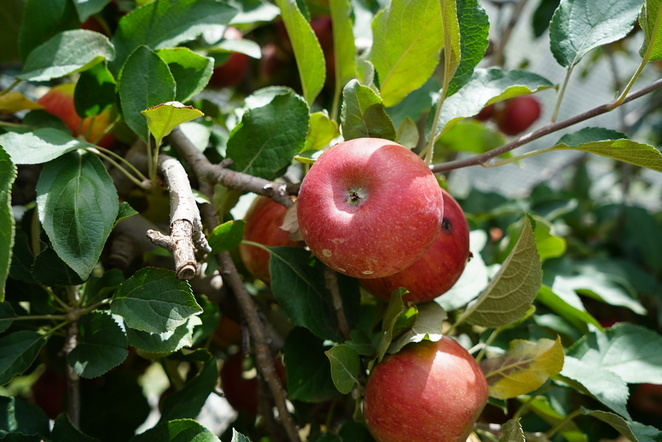 It is recommended to ring ahead and meet with Bill and Julie to get a rundown on what apples are ripe for the picking. 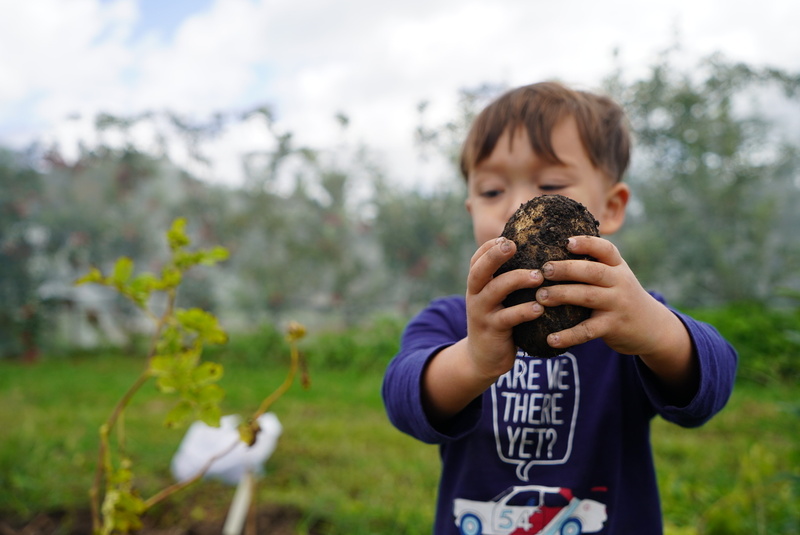 With budding chefs in the family, the kids are just as keen to see where our food comes from and eating seasonally when produce is at its best. Farmer Bill Shield provides a wealth of knowledge as to the number of bees in existence, and why it's important to a have flowering plants all the time to provide a food source for bees who in turn pollinate the flowers so we get to pick apples each year. With caution signs in place, there are only a few simple rules to follow. 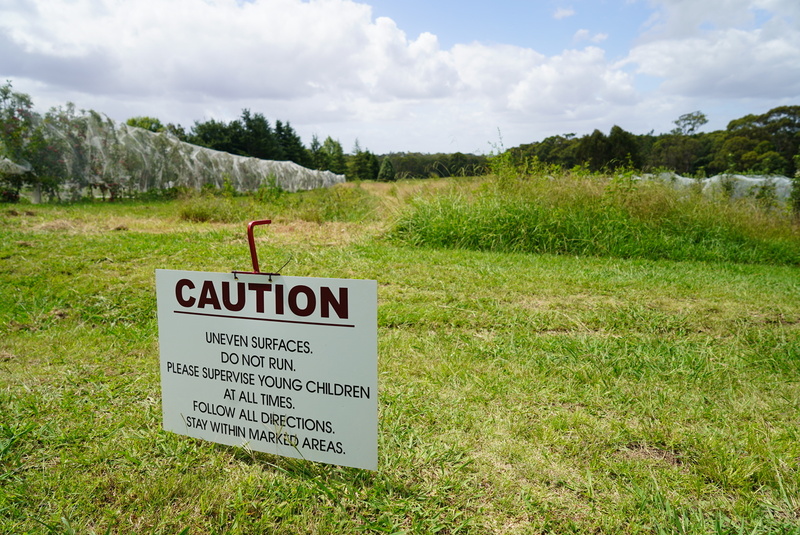 Watch where you are walking due to uneven surfaces, supervise the kids when picking (for an apple to land on one's head isn't pleasant), pay for what you pick and use the rubbish bins provided to keep the farm clean. 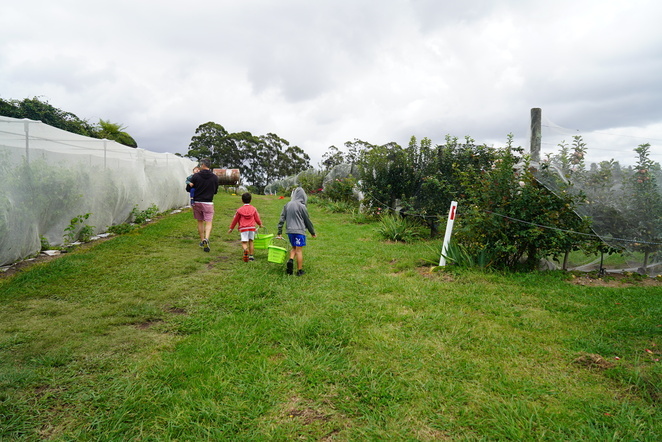 Buckets in hand, we strolled along to the witches hat and turned left to see more rows of apple trees. It doesn't take long before the kids are crawling under the nets plucking apples and taste testing along the way. And they're off to go picking. Little Mr Two loved getting amongst the action examining the fallen apples on the ground and asking if they were yummy and if he could eat them. After a quick explanation that we pick the apples from the tree, Mr Two was picking and clutching as many apples in his arms as he could and piling as many as he could into the baskets. Luckily the kids are a little bigger this year so they took it in turns to carry their basket of apples back to the shed to weigh and pay. Shields Orchard have thoughtfully provided cardboard boxes and packing tape so we could easily pack our apples to take home with us. We also harvested our potatoes that we had planted late last year, can you believe 12 small potatoes turned into 11.85kg. We have been eating potatoes for a few days now. 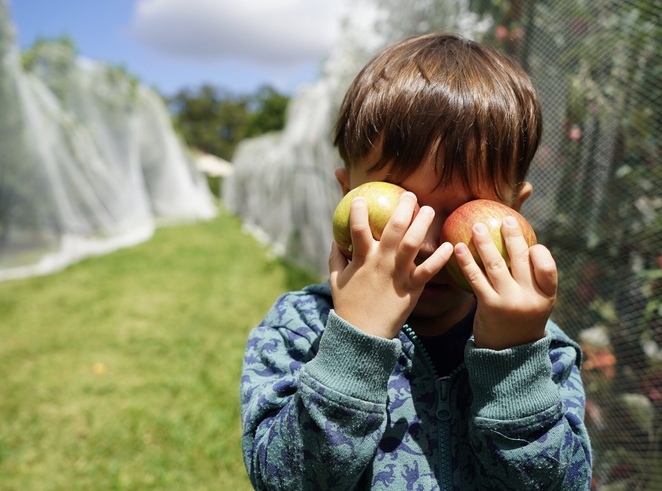 You can taste the fruit as you go and pay for what you pick at $2.70 a kilogram. We somehow managed to pick just over 12kg of Jonathon apples. I think apples are on the menu this week. So far it's been apple tart, apple muffins, apple crumble and the next request is a tarte tartin. I'm looking forward to making another great batch of apple jam which went down a treat for Christmas presents last year. Also on offer at the shed are shelves of preserves, apple cider, apple vinegar, apple juice and apple sauces. There are picnic tables available and toilet facilities. 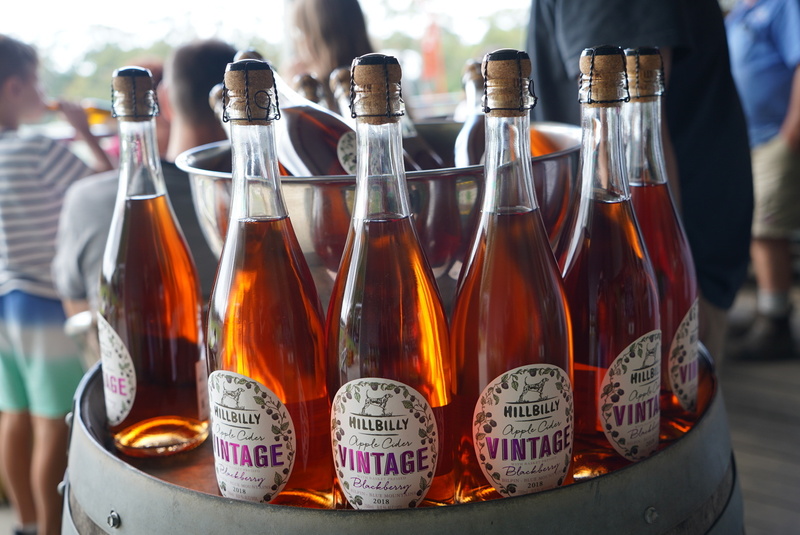 Hill Billy Cider is also onsite with their full range of drinks which include Crushed Pear, Scrumpy, Apple, Non-alcoholic Apple (which the kids absolutely love) and Vintage – from 100 per cent crushed fruit, with no added sugar or artificial flavours. Don't forget to try the award winning Hillbilly Cider's Sweet Julie made from the fruit from Shields orchard . Definitely try the Hillbilly Cider range of drinks. Reconnect with mountain surroundings with an apple or cold apple cider. With plenty of seating and tables, pack a picnic and soak in the mountain air and enjoy a glass of cider. Don't forget to ring ahead to let Bill and Julie know that you'll be coming. Pick Your Own is available between 10 am & 3 pm, Mon, Thurs, Fri, Sat & Sun. Entry is free with parking available at the front of the shed. There is ample signage leading up to Shields Orchard but if you are driving from Sydney, the orchard is located on your right, so give plenty of warning to the cars behind when your turn right into the car park in front of the shed. Why? An apple a day keeps the Doctor away.